They say that imitation is the most sincere form of flattery. But what happens when the imitation exceeds the original? 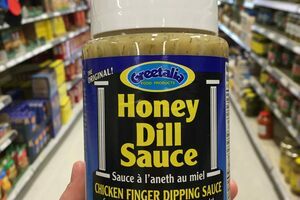 Such is the case of Manitoba’s dipping delight, honey dill sauce. Legend has it that the then-owner of Mitzi’s Chicken Finger Restaurant in downtown Winnipeg, Manitoba, was out for dinner when he received chicken with a sauce he had never tasted before. Excited by this new flavor, and unable to get a recipe, he rushed home and tried to recreate it while the taste was fresh in his mind. Exhausted after countless unsatisfying iterations, he asked wife to try his best attempt. She was so delighted by his creation that she insisted on adding it to Mitzi's menu, despite his belief that it did not match the sauce he'd tasted in the first place. Sweet, zesty, and creamy, Mitzi’s honey dill sauce became an instant hit and beloved accompaniment to a basket of chicken fingers. What's more, it became a taste of home for many Manitobans. Sure, you can make a version of the sauce at home—mayonnaise, honey, dill, dry mustard, and a squeeze of lemon will have you dipping in no time. But true lovers of honey dill will settle for nothing less than Greetalia, a favorite jarred brand with a quintessential blue and yellow bottle, which is near impossible to find outside of Manitoba.